by the league’s 10 head coaches, who are not permitted to vote for their own players. David Long Jr. is the first West Virginia student-athlete to be named Defensive Player of the Year. Jalen Hurd is the second Baylor player to be selected Offensive Newcomer of the year, joining RB Lache Seastrunk in 2012. Greg Eisworth is the fifth Iowa State player named as Defensive Newcomer of the Year with the last being DL Demond Tucker in 2015. 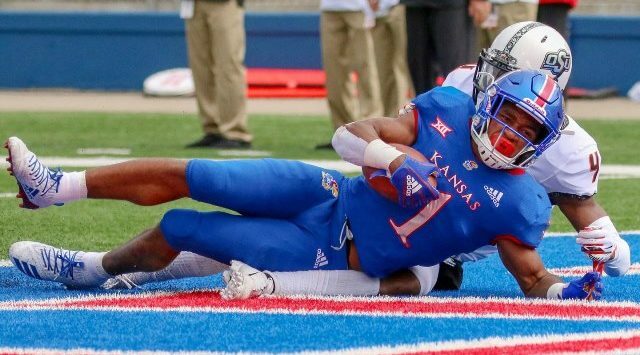 Pooka Williams Jr. is the first Kansas rookie to win Offensive Freshman of the Year. Caden Sterns is the seventh Longhorn to pick up Defensive Freshman of the Year. The last Texas winner was LB Malik Jefferson in 2015. Austin Seibert is the first Oklahoma player voted as Special Teams Player of the Year. any individual award. Oklahoma has claimed the honor three-consecutive years while K-State picked up its second and West Virginia its first. Charles Omenihu was named Defensive Lineman of the Year joining previous Texas selections Poona Ford (2017) and Brian Orakpo (2008). Matt Campbell was recognized as Chuck Neinas Coach of the Year for the second straight season while Lincoln Riley claimed his first honor. Oklahoma State (19), Baylor (15), Iowa State (14), Kansas (8), TCU (8), Texas Tech (8) and West Virginia (6). * Second Team selection in 2017. Ties created an additional position at TE and PK. *Second Team selection in 2017. Ties created an additional position at OL and KR/PR. (STPoY), Brock Purdy (OFoY), Mike Rose (LB & DFoY), Sam Seonbuchner (FB), Marcel Spears (LB). Gabriel Rui (PK), Bryce Torneden (DB), Daniel Wise (DLoY). K-State: Devin Anctil (P), Kyle Ball (DL). CeeDee Lamb (WR), Kenneth Mann (DL), Parnell Motley (DB), Kenneth Murray (DPoY), Austin Seibert (P), Trey Sermon (RB). Jenkins (OL), Marcus Keyes (OL), Justin Phillips (LB), Malcolm Rodriguez (DB), Jelani Woods (TE). TCU: Ben Banogu (DLoY), Corey Bethley (DL), TY Summers (LB). Elijah Rodriguez (OL), Patrick Vahe (OL). Dominic Panazzolo (P), Terence Steele (OL), Joseph Wallace (DL), Broderick Washington Jr. (DL). (OL), Josh Norwood (DB & DNoY), Evan Staley (PK), Keith Washington (DB).